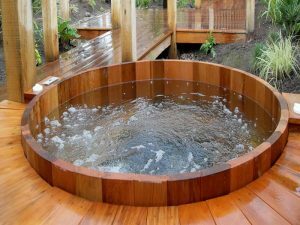 Removing a hot tub or spa from your backyard can seem a bit daunting. It’s filled with a few hundred gallons of water, has electrical hookups, and can sometimes be embedded in the deck itself. Different circumstances will require you to make different decisions. You might want to move it while it’s still intact. 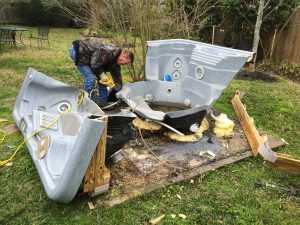 Other times, you don’t care about destroying the hot tub because you’re getting a new one. 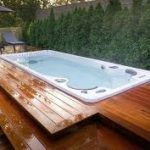 If you plan on removing the hot tub because you want to move it to a new home, you might need to hire a professional. It can be time consuming to remove all the water from the unit and disassemble it properly. You don’t want to ruin the shell, skirt, or mechanical parts of the spa. Old tubs will need to be destroyed to make way for new ones. It doesn’t make sense to leave the spa intact since you’ll need to find a place for disposal. 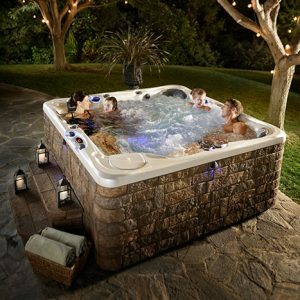 It’s easier to dispose of the hot tub when it’s in manageable parts and pieces. 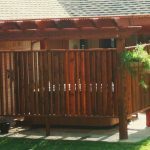 When you destroy the hot tub, don’t do anything destructive that will impact the deck or foundation. You’ll need that for the next spa. You’ll likely know how to do this already if you’ve owned the spa. You might have inherited this spa from the previous homeowner, though, so we’ll detail a bit on how to drain the tub. Turn off the electrical switch to the tub. To ensure that the electricity is completely off, you can flip the circuit breaker, too. On the bottom of the hot tub, there should be a drainage spout. 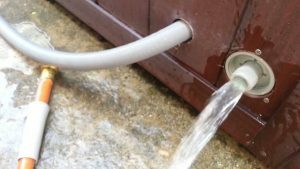 Attach a garden hose to the spout, so that your yard doesn’t get flooded. You’ll be able to direct the flow of water to an area that won’t become overwhelmed. Once most of the water is removed, you can use a wet/dry vacuum to remove the puddles that remain in the bottom of the tub. You’ll want the tub as dry as possible before you attempt the next steps. 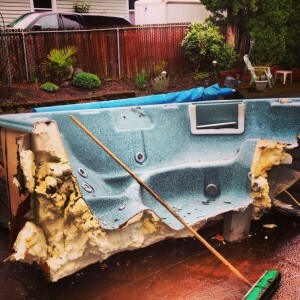 If you plan on taking the hot tub apart to move it, you’ll want to read the manual. That will remind you of the steps it took to assemble the spa when it was installed. 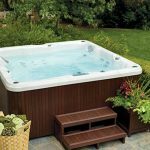 For those who inherited the hot tub from previous owners, the manual can usually be found on the manufacturer’s website. It’ll detail the location of the tubes and electrical wiring as well as how to destroy or remove the skirt and the tub itself. The outside of the spa might be made from tongue-and-groove parts. You’ve lucked out if that’s the case. You can easily remove those parts without sawing. Use the instruction manual to see where parts have been screwed in, so you can remove those without taking the time to saw through them. The shell of the tub is the hardest part to remove from the yard. It’s normally one piece that’s full of stainless steel jets. You’ll want to cut it into pieces without hitting those bits of the inner workings. It will be tempting to cut directly down the middle to remove the tub, but you might have to cut into pie wedges to avoid the jets and tubing. This is the time to get out the saws and protective gear. There will be lots of dust and debris flying. With the saws working, you’re introducing electricity to the process, which is why it was important to drain all the water from the tub. You might have to bring in a dumpster for disposal. It’s unlikely that city trash pickup includes huge pieces of your old hot tub. You’ll end up being fined, anyway. You could hire a dumpster service, or bring the hot tub to the dump yourself. 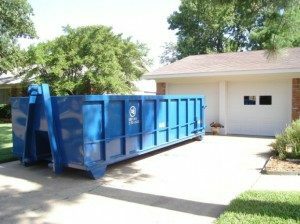 If you have a truck and some friends to help, that will be the least expensive way to dispose of the pieces. Call your city to find out when they allow drop-offs to waste disposal. Once the area is cleared of the old hot tub, it’s ready for the new arrival of your hot tub. If you don’t plan on purchasing a new one. The concrete foundation can be removed with a sledgehammer. Use the same protective gear when removing the foundation, too. 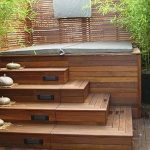 The steps in the process are dictated by the ultimate destination of your hot tub. It could be going to the new home or headed to the local dump. 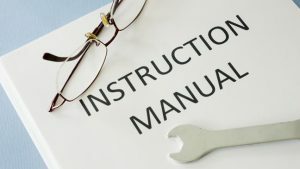 You’ll still need to read the manual in either case. It’s important to understand the inner workings of the tub whether you’re destroying it or removing it.